They went for a 4-days event full of joy, colors and delicious Indian food. The first day was the Sangeet, it means the engagement party, where the couple exchanged the rings and promises. As it was December and quite cold, the party took place under a glass marquee decorated with crystal chandelier and a magenta fitted carpet. The colour palette of the night had burgundy as main color and the atmosphere was so classy and chic with a scent of elegant noir. The day after was time of Mehndi! That’s the most awaited event during an Indian wedding as it is a very informal party full of color and joyful music. During the Mehndi the bride gets the henna tattoos on her foot and hands for hours! 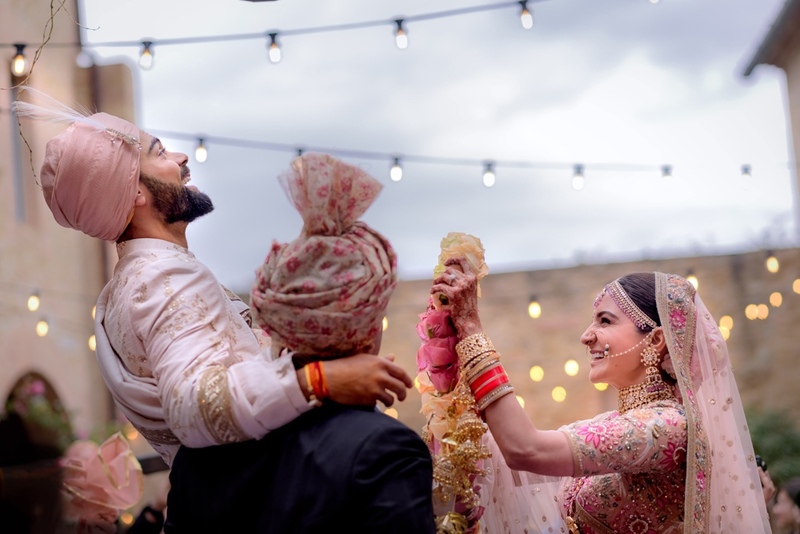 It was nice to see Virat feeding Anushka as she was unable to do it herself! The ladies were going crazy with tattoos and favors Anushka chose for them: a colorful bag with bangles and bindis (the dot Indian women wear on their forehead). In this case flowers and clothes were literally full of color, there wasn’t a precise palette but everything was bright and popping. 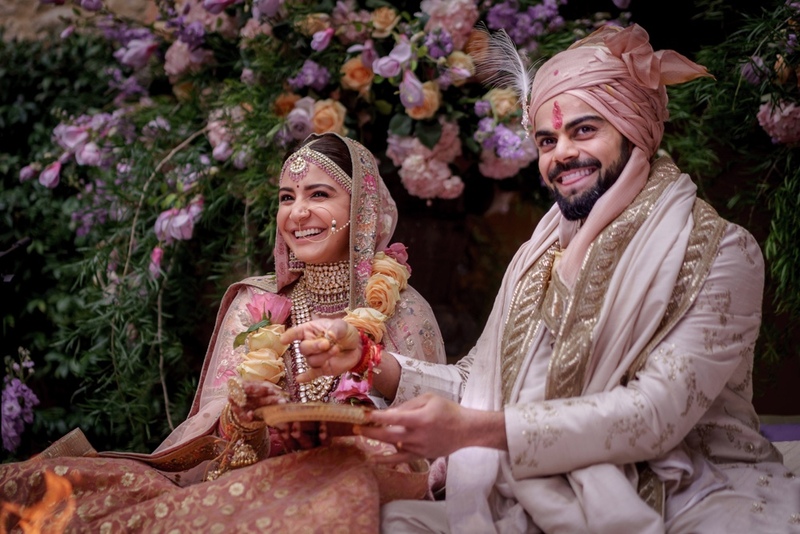 Designer Sabyasachi did a great job with Anushka’s dress and jewellery. She was stunning and very simple though. In the middle of the marquee there was a bloomed peach tree, which is not common in Tuscany in that period. It seemed to be on a spring day, even though it was December! Finally the Wedding day on December 12th 2017. 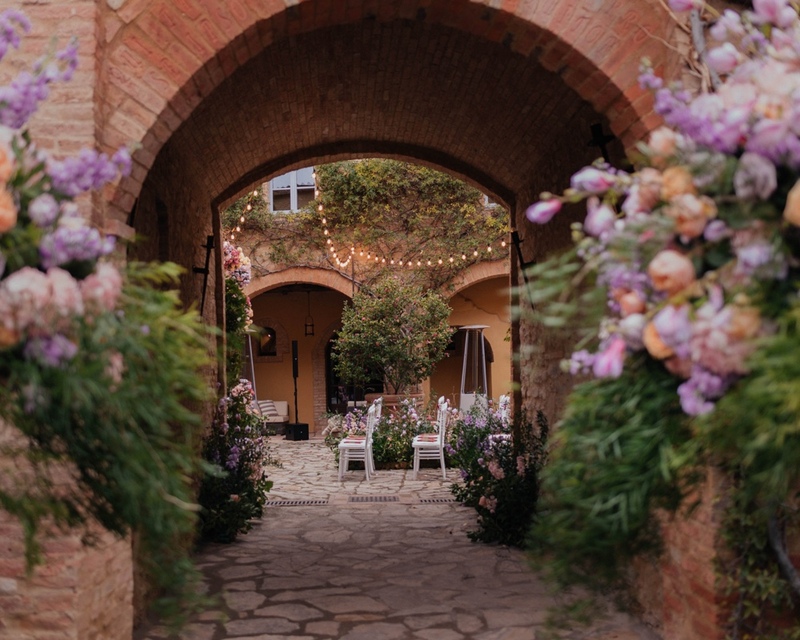 The weather was mild enough to perform the ceremony in the courtyard of the venue. 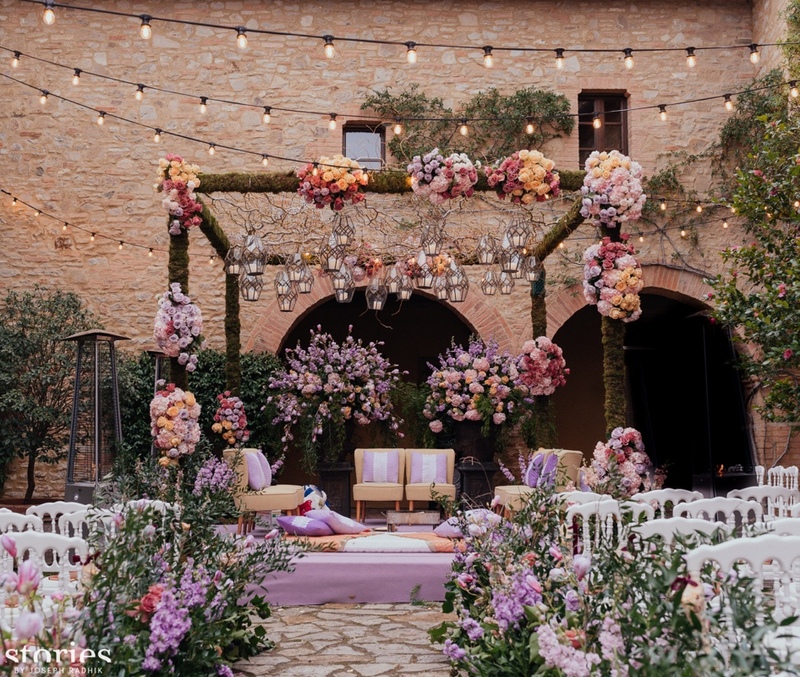 The setting was perfect with decorations on point and tons of flowers. 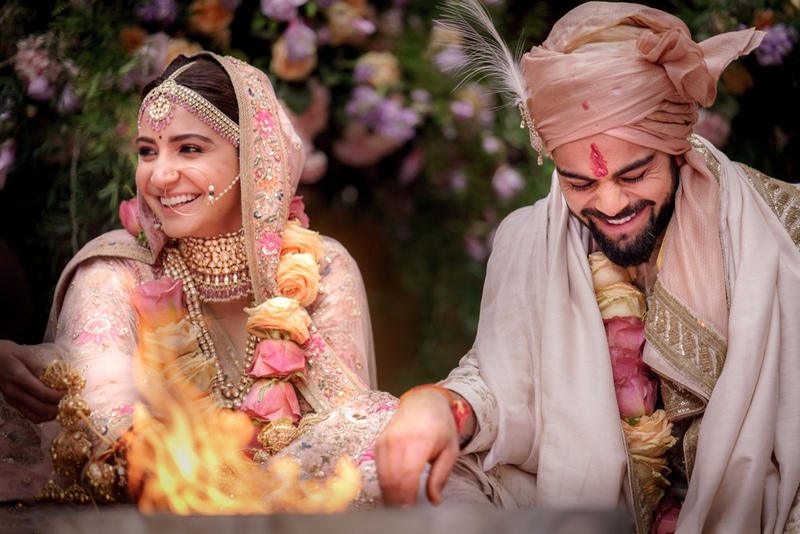 Before the ceremony started, two dhol players brought Virat to bride’s family for the Baraat, the groom’s wedding procession. It was an enjoyable moment, everyone was dancing and laughing. 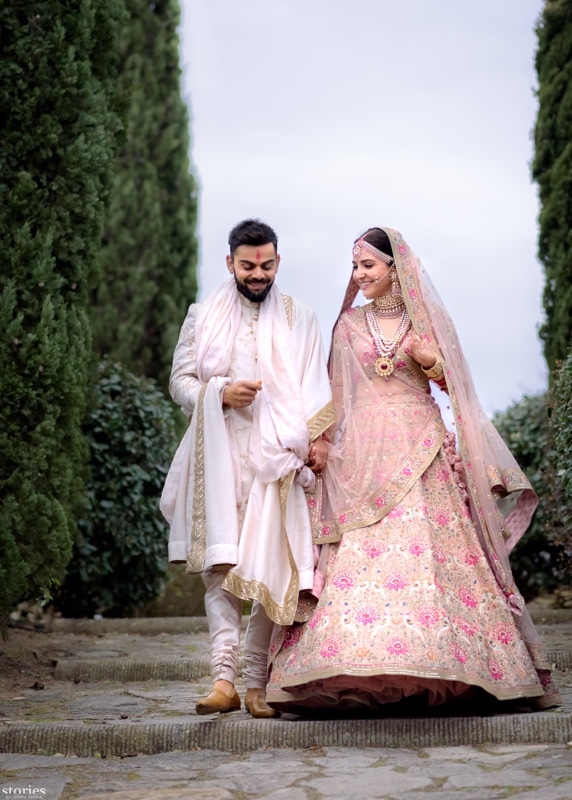 Once guests, groom and Pandit were in the courtyard, Anushka arrived on her pale pink dress and a low bun decorated with Tuscan hydringes. The ceremony was very intimate, hot milk and coffee were served for the guests as it took more than 1 hour. After the declaration of the newly wedded couple, they retreated in their room for the Vidai and the guests had the chance to get warm and change their clothes for the long night! The reception was elegant and after a while people started to dance while eating… in few hours they were all together on the dance floor celebrating love with disco Indian music! Good memories for us and great feelings all the time with wonder about it. We want to renew our wishes for their first anniversary and for all the best in their life! « The best wedding music you can’t miss!